We are hosting Thanksgiving this year, and per form, back when hosting was still a hypothetical prospect, The Seven-Year-Old and I got pretty excited about the possibilities. What did they serve at old-timey Thanksgivings? My 1905 New England Cookbook is on loan to a friend right now, so I pulled out my 1896 Fannie Farmer instead. Conveniently, it includes a menu for a Traditional Thanksgiving Dinner on page 520. 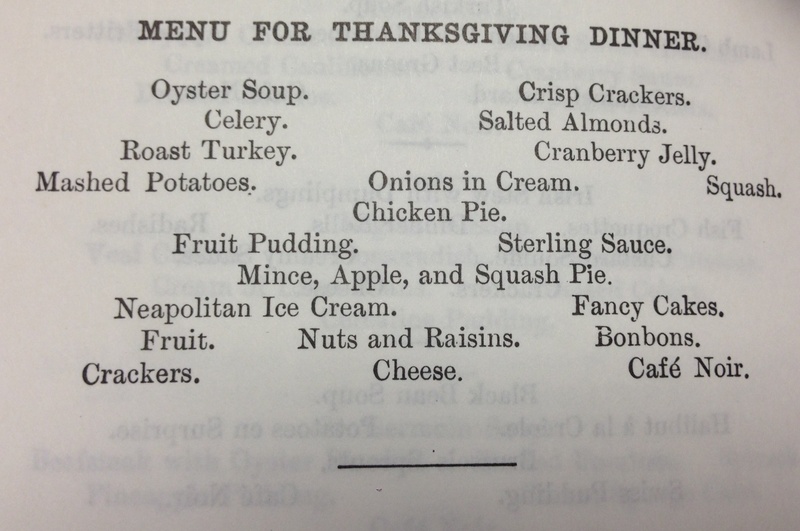 Traditional Thanksgiving Menu from the 1896 Fannie Farmer cookbook. The roast turkey, mashed potatoes, squash, apple pie, cranberry jelly, crackers & cheese, and nuts & raisins we’d have anyway. And really, how hard could it possibly be to set out celery, salted almonds, ice cream, fruits, fancy cakes, and bonbons as well? Cafe noir turns out to be extra-strong black coffee, served after dinner, with or without sugar. Let’s call it espresso, and we’re done. … as the stretch foods, so to speak. How do you make squash pie? Squash pie was the least disgusting sounding of the remaining foods. At least to me. I assumed that it was just a variant of pumpkin pie, which I’d serve anyway. So I looked it up first. There you go. Sounds fine. Ok. It’s not like The Seven-Year-Old would have eaten the pumpkin pie anyway. Next least disgusting was mince meat pie. 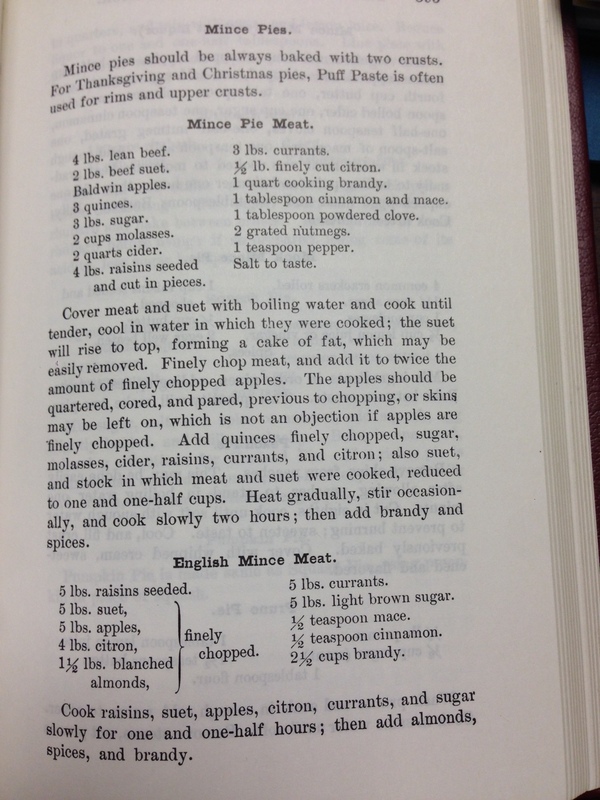 I’d had mince meat pie every year growing up. How bad could the original recipe for it be? Well, that takes care of that. Looks like we’re not going to have an old-timey Thanksgiving after all.